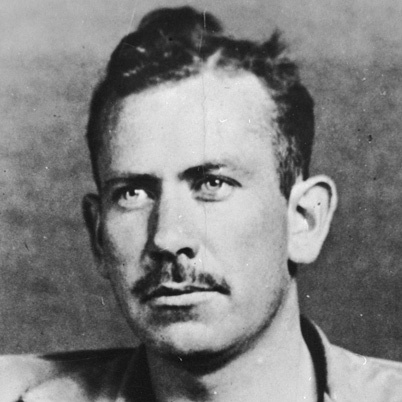 Full Name: John Ernst Steinbeck, Jr.
John Steinbeck was a Pulitzer Prize-winning novelist whose book The Grapes of Wrath portrayed the plight of migrant workers during the Depression. Born February 27, 1902, in Salinas, California, John Steinbeck dropped out of college and worked as a manual laborer before achieving success as a writer. His novel The Grapes of Wrath—about the migration of a family from the Oklahoma Dust Bowl to California—won a Pulitzer Prize and a National Book Award. Steinbeck served as a war correspondent during World War II. He died in 1968. American novelist John Ernst Steinbeck, Jr. was born on February 27, 1902, in Salinas, California. His books, including his landmark work The Grapes of Wrath, often dealt with social and economic issues. He was raised with modest means. His father, John Ernst Steinbeck, tried his hand at several different jobs to keep his family fed: He owned a feed-and-grain store, managed a flour plant and was the treasurer of Monterrey County. His mother, Olive Hamilton Steinbeck, was a former schoolteacher. For the most part Steinbeck, who grew up with three sisters, had a happy childhood. He was shy but smart and early in his life formed an appreciation for the land, and in particular California’s Salinas Valley, which would greatly inform his later writing. According to accounts, Steinbeck made the decision at the age of 14 to become a writer and often locked himself in his bedroom to write poems and stories. In 1919 Steinbeck enrolled at Stanford University. But Steinbeck seems to have had little use for college. He viewed himself strictly as a writer, and his decision to go to Stanford was made more to please his parents than anything else. Over the next six years Steinbeck drifted in out of school, eventually dropping out for good in 1925 without a degree. Following Stanford, Steinbeck tried to make a go of it as a freelance writer. He briefly moved to New York City, where he found work as a construction worker and newspaper reporter, but then scurried back to California, where he took a job as a caretaker in Lake Tahoe. It was during this time that he wrote his first novel, Cup of Gold (1929), as well as met and married his first wife, Carol. Over the next decade, with Carol’s support and paycheck, Steinbeck continued to pour himself into his writing. His follow-up novels, The Pastures of Heaven (1932) and To a God Unknown (1933), received tepid reviews. It wasn’t until Tortilla Flat (1935), a humorous novel about paisano life in the Monterrey region, that the writer achieved real success. Steinbeck struck a more serious tone with In Dubious Battle (1936), Of Mice and Men (1937) and The Long Valley (1938), a collection of short stories. What is widely considered his finest, most ambitious novel, The Grapes of Wrath, was published in 1939. The book, about a dispossessed Oklahoma family and its struggle to carve out a new life in California at the height of the Depression, captured the mood and angst of the nation during this time period. At the height of its popularity, The Grapes of Wrath sold 10,000 copies a week. It eventually earned Steinbeck a Pulitzer Prize in 1940. Hi I am an old hippie, a "beat" poet and novelist, and digital artist. I was co -editor and publisher of "Alpha Beat Press" alpha beat soup, bouillabaisse and cokefish and cokefishing in alpha beat soup with my late husband Dave Christy. My novel "eeenie meenie minee moe is for sale on amazon books. my other blogs are http://tilliespuncturedromance.wordpress.com about humor and the weird. The blog is named after a Charlie Chaplin movie. http://concretebologna.wordpress.com a blog about world art. A REALLY COOL BLOG-CHECK IT OUT! My New Blog. hobostew.home.blog give it a shot and check it out. It's about alternative news, counterculture, Americana, art and more. Link in my bio. The home page of musician, songwriter, blogger and photographer Kenny Wilson from Leicester U.K. The WWII US Navy career of my father, Red Stahley, PT boat radioman. The works and artistic visions of Ken Knieling. Touring the USA on a Moto Guzzi Breva 750.